In 1942, Melbourne was in the grip of brown-out. In the shadows of Melbourne's streets, three women were brutally strangled and killed by the 'Brown-out Strangler', Edward Joseph Leonski. Leonski was a US soldier stationed in Melbourne after the Japanese attacked Pearl Harbour. He was well liked by most that knew him, although other American soldiers reported that he liked to drink heavily and that when he did, he became aggressive, particularly towards women. In the early hours of 3 May 1942, the body of 40-year-old Ivy McLeod was found partially naked, strangled, and badly beaten. Witnesses said they had seen her in the company of a US soldier late the previous night. Three days later, another victim was found. The marks on her body indicated the killer had large hands and considerable strength, attributes Leonski shared. Shortly after this, Leonski admitted to another soldier that he had killed two women. When the soldier told Leonski to give himself up and plead temporary insanity, Leonski refused. Several nights later, Australian soldier Neil Seymour found Leonski covered in mud, asking for directions back to camp. The next morning, a third victim was found in a muddy trench near the camp. Police found the mud-covered Leonski and he was arrested and charged with the murders. The trial was convened by the US military, and Leonski was convicted and sentenced to death. It was the first time that any person has ever been tried in this country by a military tribunal for a crime which violated civilian law. ...when Leonski gets drunk, his voice changes... [he] talks more like a girl... says stuff about poltergeists, werewolves, demons. Creepy stuff' Talks to himself a lot... other times it's like he was talking to someone else. Whiticker, AJ 2005, Twelve crimes that shocked the nation, New Holland, French's Forest, N.S.W. This quote was probably taken from a court transcript – a record of everything said in a trial. Transcripts are great resources if you're researching a particular legal case. You can find them online at the Australian Legal Information Institute. Indeed, in the past Leonski had boasted of an alter ego called ‘Buddy', and claimed that it was he who had committed the crimes. But the truth behind his brutal murders remains a mystery, as he was convicted and sentenced to death by hanging at Pentridge Prison. Melbourne's Gangland War was a string of bloody killings that opened the city's eyes to a criminal underworld. In 1986, bombing at the Russell Street Police Headquarters forced Melbourne to face possible terrorism. 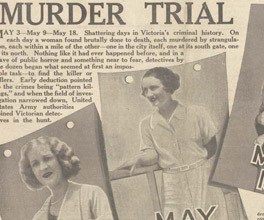 A brutal murder captured Melbourne's imagination and sparked intense public debate.